What’s one thing all uni students should have in their fridge? Cheap, easy, tasty…fun? I shouldn’t have to egg you on to start making some egg-tastic recipes. I’m sure there are just about as many awful egg puns as there are different ways to cook them. Anyways, after having eggs on toast every day for at least a week I decided it might be time to give my eggs a makeover. So I added a multitude of great ingredients. Warm, flaky pastry. Crisp, salty bacon. Soft, fresh mushrooms. Strong, rich feta cheese. And spinach to round it all out. 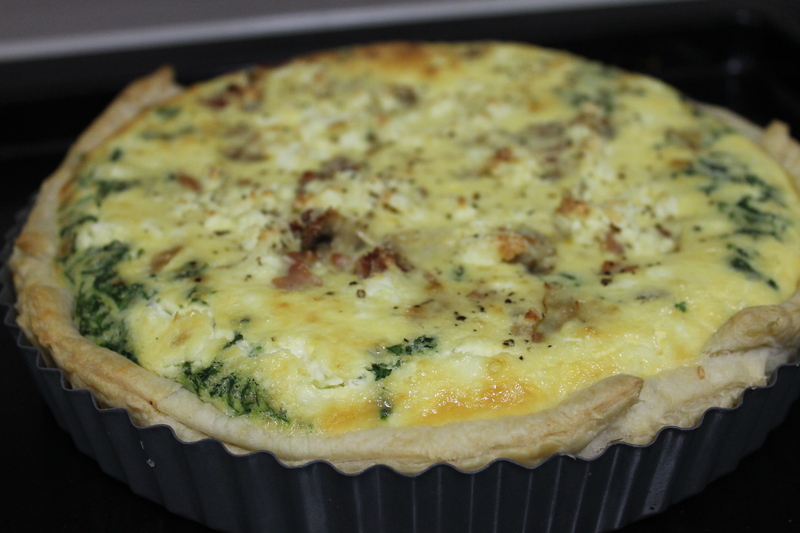 And thus, I got a quiche. If you’re lazy (or time-efficient if you ask me) you can use frozen pastry for the crust and it’ll save you a bunch of time and effort. And other than that you’re sauté-ing for a bit, doing a quick whisk, pushing a few buttons on your microwave and voila! 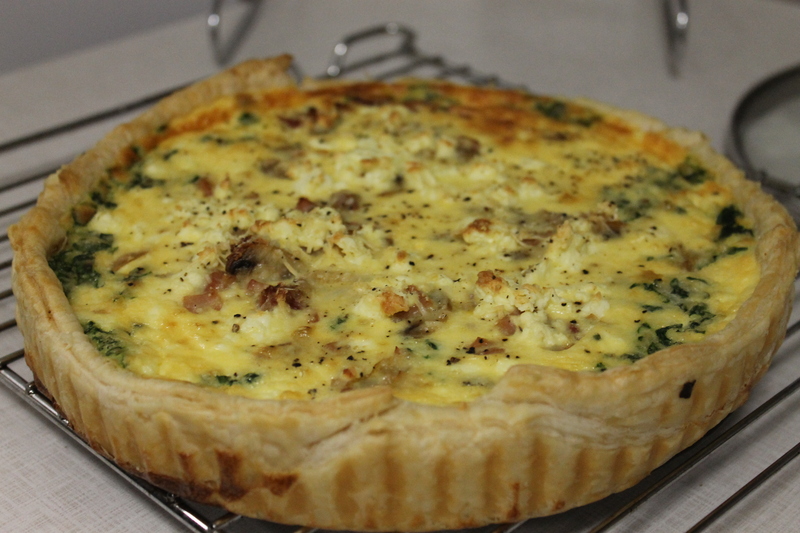 You just have to stick it in the oven and wait for a beautiful pie bursting with some pretty fancy looking eggs. If you’re cooking for one, you’ll have about five or six servings (aka lunch/dinner for almost three days). Or two days if you can’t help yourself come breakfast. Let your pastry sheets thaw enough that you can move them. Grease a pie tin with a bit of butter and then lay the pastry sheet in the pan, using the ½ sheet to make the sides even. Chop the onions and garlic and sauté them in a pan with a teaspoon of olive oil for a few minutes. Add the bacon and sauté until crispy. Add the mushrooms and sauté until soft. Put the spinach in a microwaveable container and put it in the microwave for 1 minute, or until wilted. Squeeze out the excess water. Beat the eggs, milk and cream until light and fluffy, add salt and pepper. Place the spinach into the prepared crust. 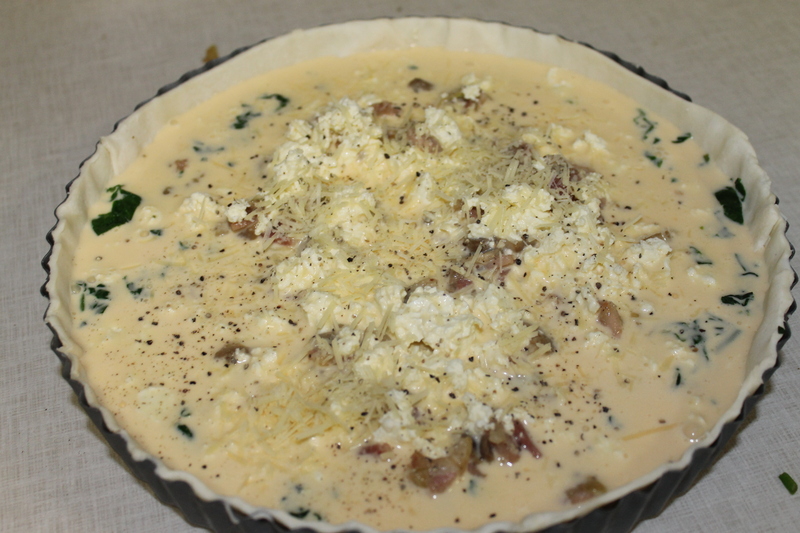 Top with the bacon, onion, mushroom mixture and then pour the egg mixture over the top. 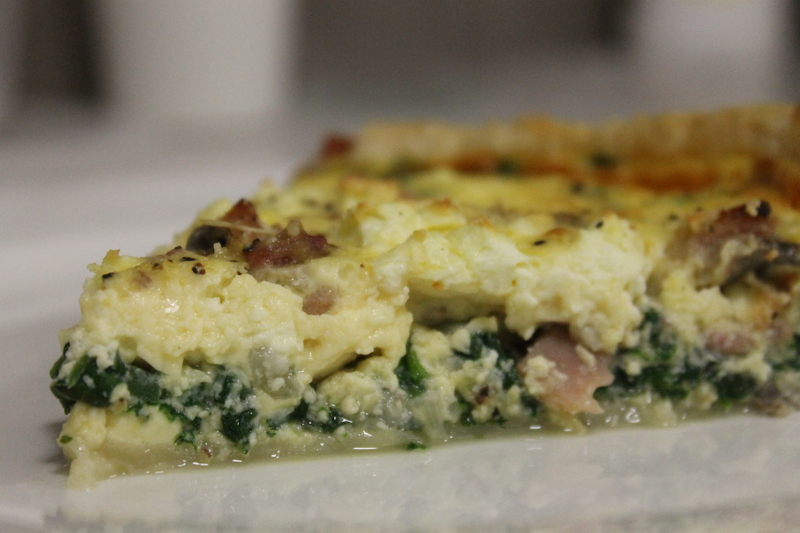 Sprinkle the feta cheese over the egg mixture and finish with the parmesan on top. I baked this according to the instructions on the frozen pastry box, so at 200C fan-forced, for 35-45 minutes. For a while I really wasn’t sure what the fuss was over haloumi. Honestly I hadn’t even heard about it much before coming to Sydney. Over here though you can find it everywhere. I guess it has taken over the place of feta or goat’s cheese in salads across the city. To be honest, I just kept seeing the name everywhere and for ages I thought it was a type of mushroom…not a type of cheese. But turns out, it is a cheese and it is darn tasty. So I decided to cook some for myself. This recipe is probably best done on the grill, haloumi has a very high melting point which makes it ideal for grilling or frying, but I don’t own a grill so I pan-fried this salty little treat. I simply seasoned it with some lemon juice, salt and pepper and paired it with some steamed asparagus and sauteed mushrooms. Simple, easy, done. And it’s under 500 calories. 1. Preheat grill pan or barbecue. 2. Combine oil, lemon juice and pepper in a small bowl. Toss through mushrooms and haloumi. 3. Place mushrooms and haloumi on grill pan or barbecue and cook, 5 to 7 minutes, turning regularly to prevent haloumi from burning. 4. Steam asparagus, 2 to 3 minutes. 5. 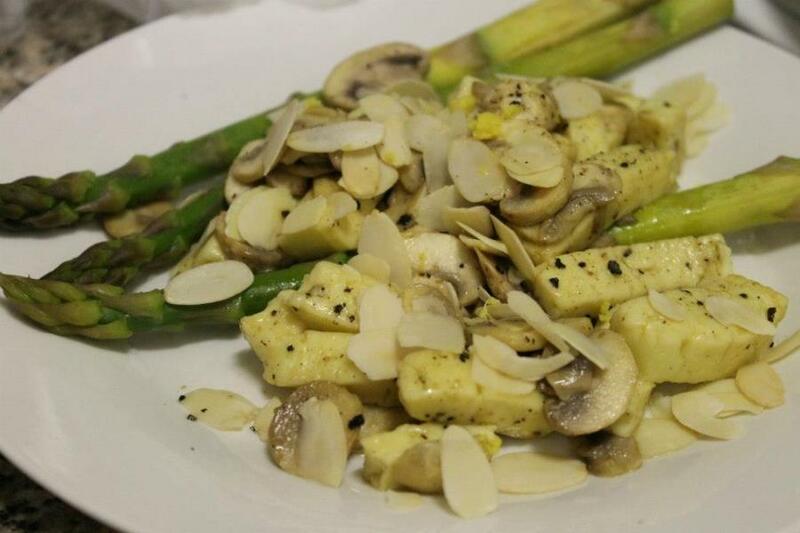 Arrange mushrooms, haloumi and asparagus on serving plate and scatter on lemon zest and almonds.